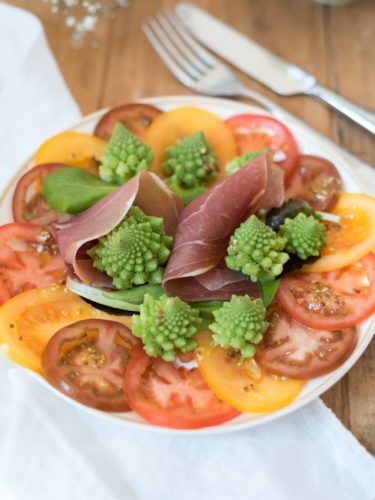 A new salad full of colours and lightness with this coloured tomatoes and romanesco salad! I find the tomatoes beautiful, it gives a real plus to your dish. 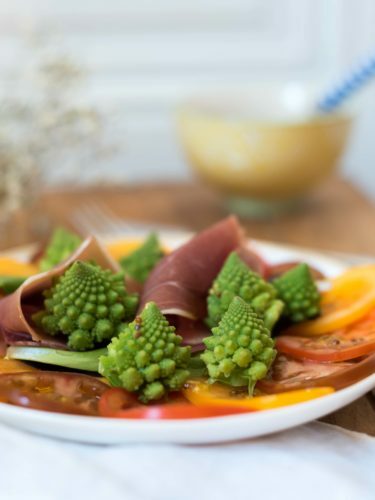 Regarding the romanesco, this is the first time that I cook it and I found the taste very close to the broccoli and it brings some crispy to the salad. If you want to add some carbo to your meal, just add some cooked sweet potatoes. Wash and cut in bunches your cabbage. Cook it in simmering water for 7 min approximately, then place in a cold bath of water to keep its color. Your cabbage still needs to remain crispy. 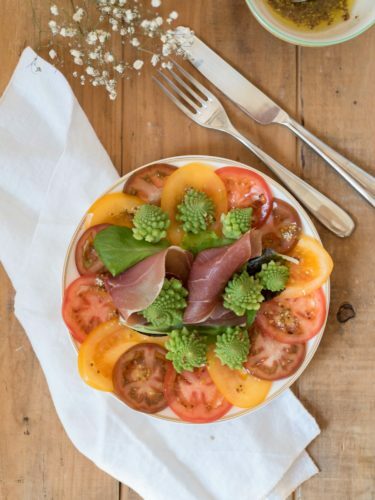 Ideally using a mandolin (otherwise a knife), finely cut your tomatoes in the length and then display it all around the edge of your plate in a rose window shape. Then place the slice of Parma ham and then the cabbage in the center. In a bowl, stir the mustard with the lemon juice and olive oil. Add salt and pepper and stir again. Put the sauce on your salad and enjoy!